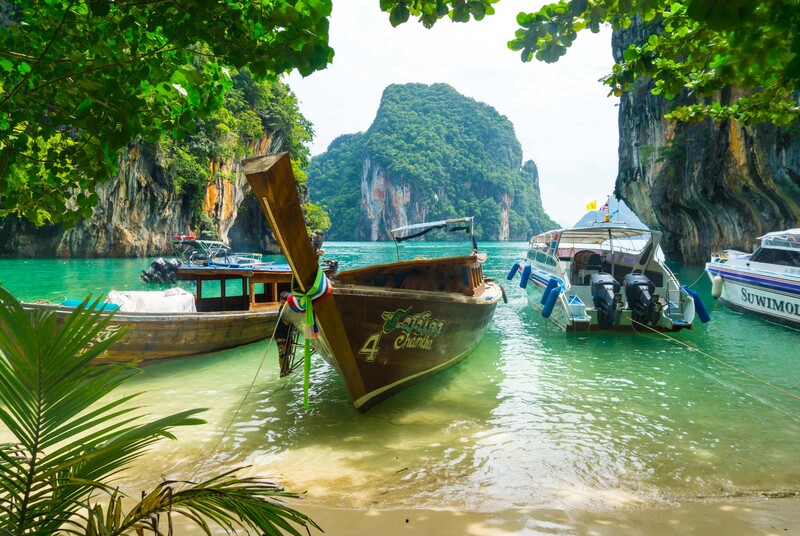 Thailand is a fascinating country located in Southeast Asia. This was one of the place we went for our honeymoon. 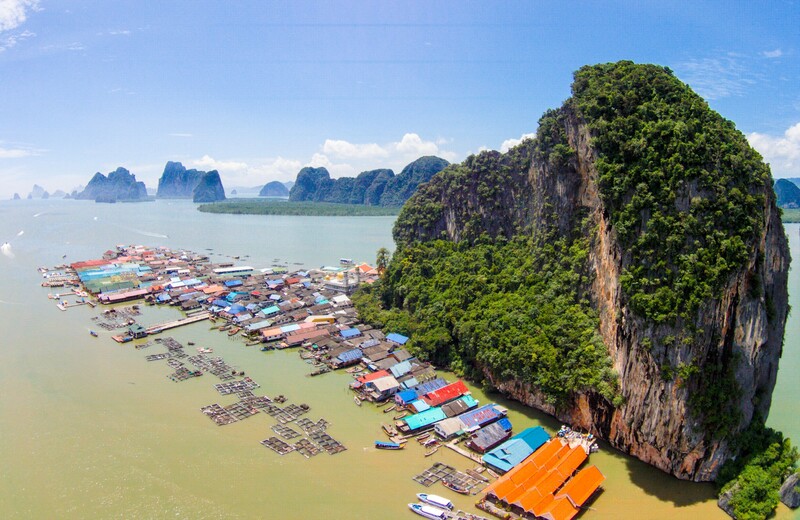 The country offers great food, culture, beaches, and amazing scenery. 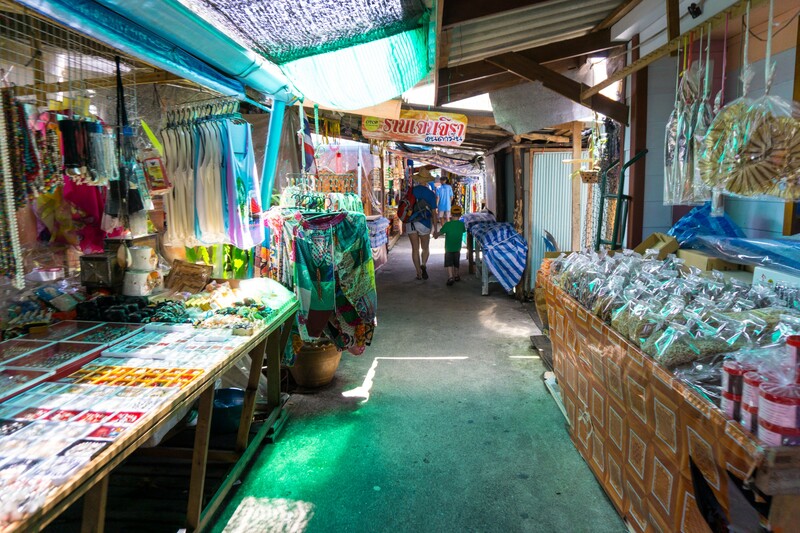 Our favorite city in Thailand by far is Phuket! 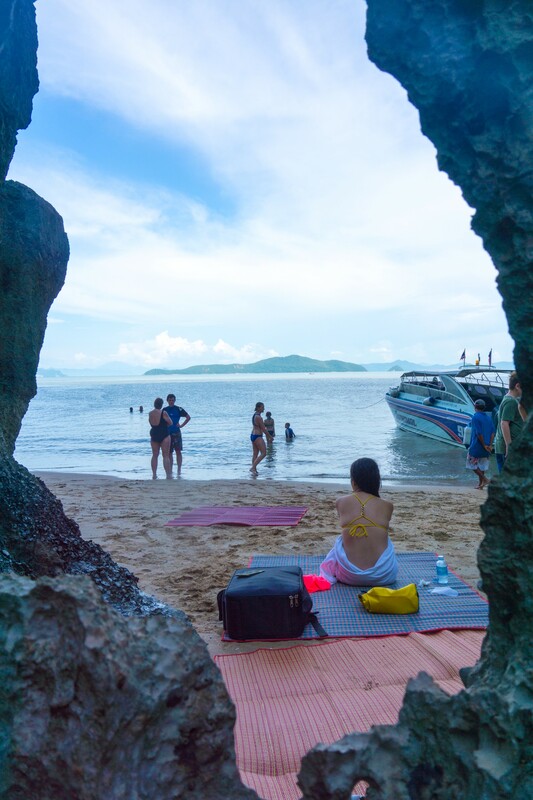 If you are visiting Thailand or another country nearby, you should definitely stop by Phuket for 3-4 days. It’s a must see and we’ll share our experiences and tips in this blog. It is a beautiful place and one of our favorite! 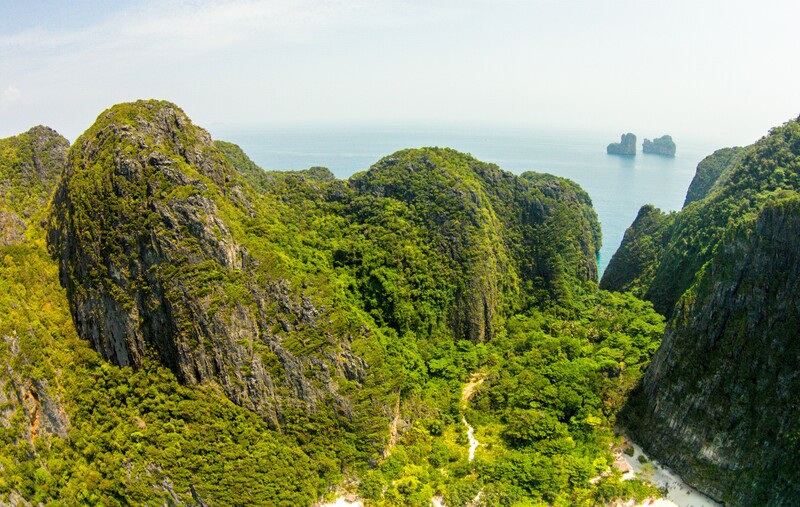 You must do the two main excursions while there, to Phang Nga Bay and Phi Phi Islands. Click on the images to see the pics! All photos were taken by us and the drone :). Questions after reading, you can post in the comments. We arrived to Phuket airport at around 11:30pm and was transported to our hotel. Phuket is actually a big area so the taxi ride from the airport to almost anywhere downtown is approximately 45 mins for 800 Baht (~$20). 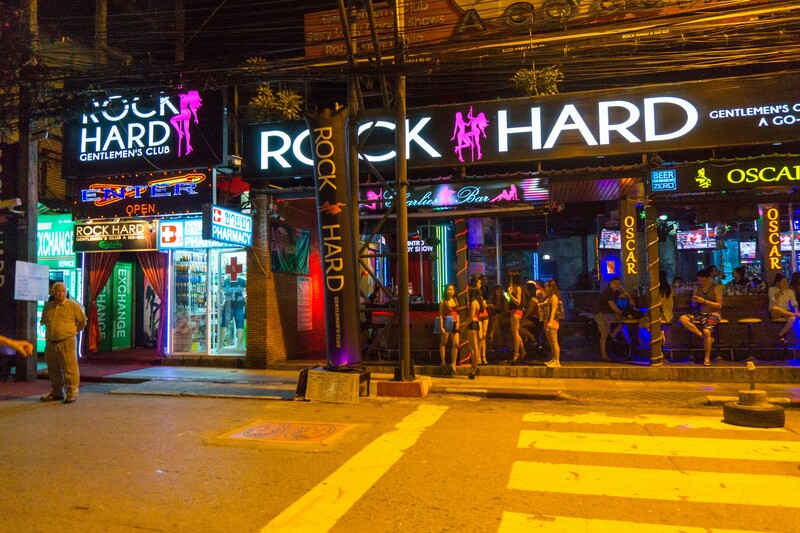 We stayed at the Lantern Resort Patong ($50/night) which is an area well-known for its night life and bar scenes. 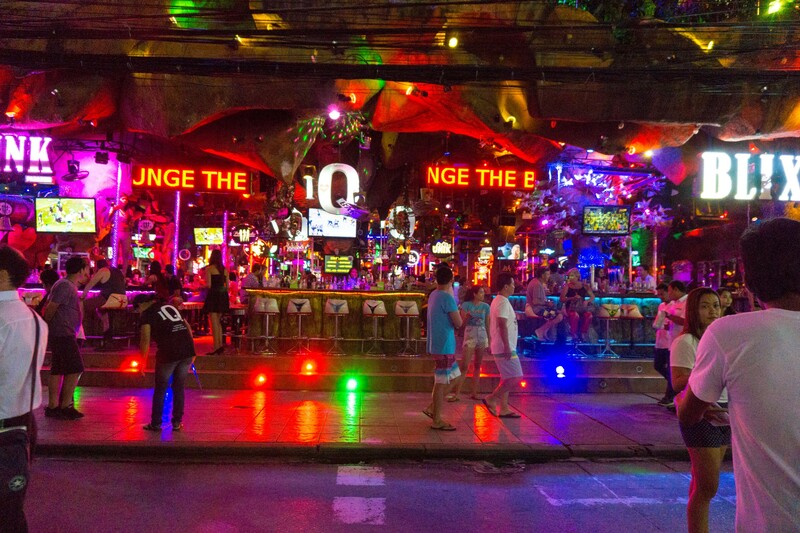 Our hotel is about a 3 mins walk from the famous Bangla Road which is where you’ll see many bars and Thai girls escorting men to night clubs. Upon check-in to the hotel, we noticed the genuine Thai’s hospitality to its guests. 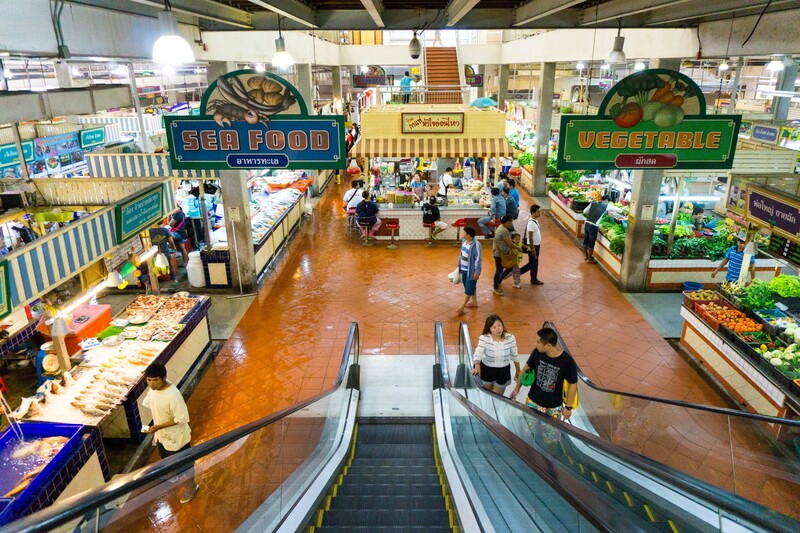 The next morning, we visited an in-door Banzan market closeby to the hotel where they sell fruits and live seafood on the ground level and upstairs they have a food court to cook the fresh seafood that we purchased downstairs. Did we mention that we love seafood? After a full lunch, we got some fruits along the street to top it off. The seafood meal you see below, costs about $60 USD, which is pretty high for the average Thai local, but is definitely cheap compared to the US. 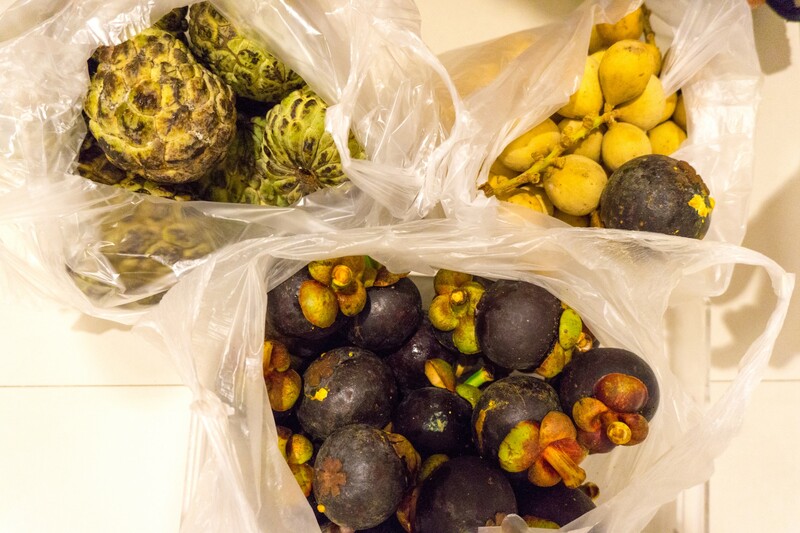 You must try the three fruits in the picture below, they cost about 50 to 75 cents per lb. In the US, these fruits would cost $8+ per lb and the quality is as not good either. So enjoy it while you’re in Asia! 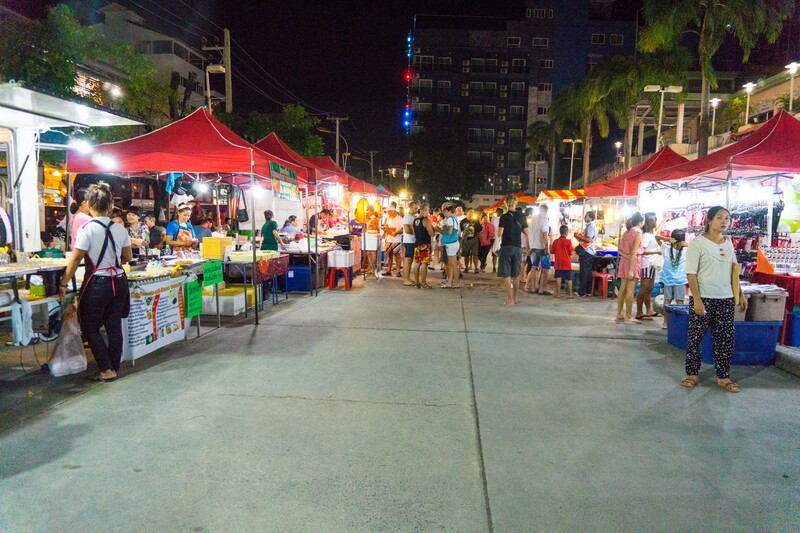 After a full meal, we got Thai massage courtesy of the hotel then took a walk along side the street to check out the area. 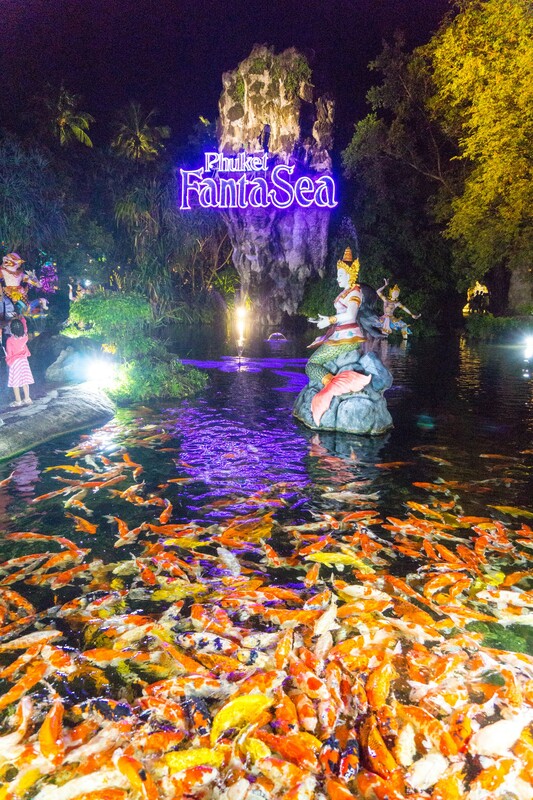 For the evening, we got tickets to see the Fantasea show ($60/pp) which is a live show theatrical Thai cultural show with animals’ performance. The tickets can be reserved in advance online with arranged transportation from the hotel to the show and payment is made at the box office upon arrival to the show. 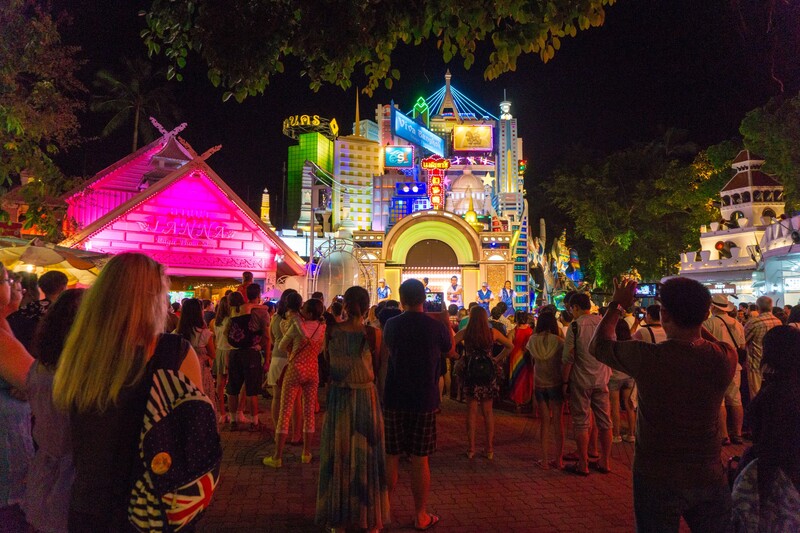 After paying for your tickets at the box office, you proceed to the Fantasea theme park, this is where you’ll find carnival, restaurants, shops, and entertainment. Around 10-15 minutes prior to showtime they will announce for you to proceed to the theater. Prior to entering the theater, you will have to check-in your cameras and phones as they will not allow pictures taken on these devices inside the theater. Our check-in was smoothly and efficient. However, the lines at the end of the show to get your cameras and phones are a mess. I guess that is the way it has to be for watching the show and no other way around it. We were a bit disappointed with how the inefficiency of the lines were after the show to get our belongings. The show itself was entertaining and lively and very much like something you see at a Vegas show. 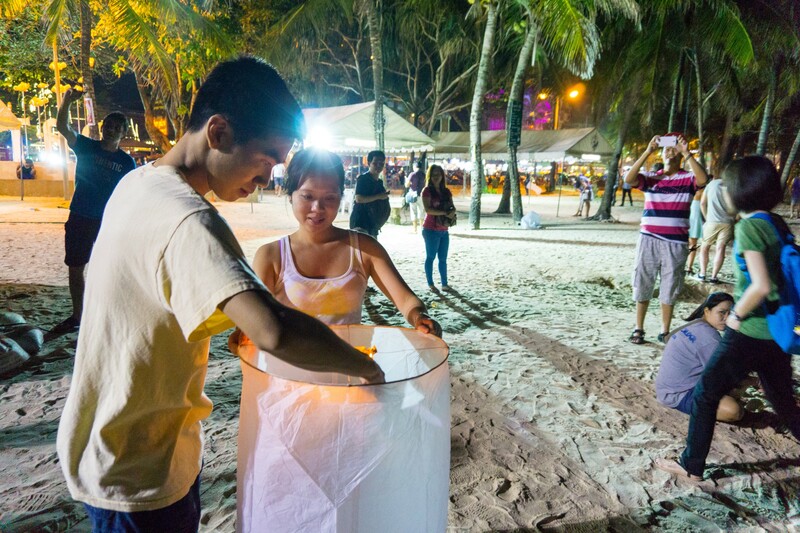 We would recommend this show if you’re staying more than 2-3 days in Phuket as this is a touristy thing to do. 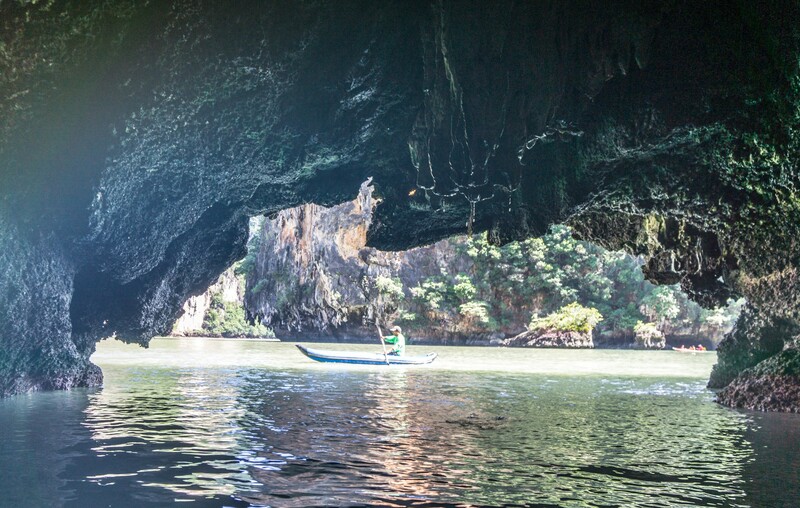 The next day, we took a tour with Phuket Sail Tours to Phang Nga Bay ($100/pp). 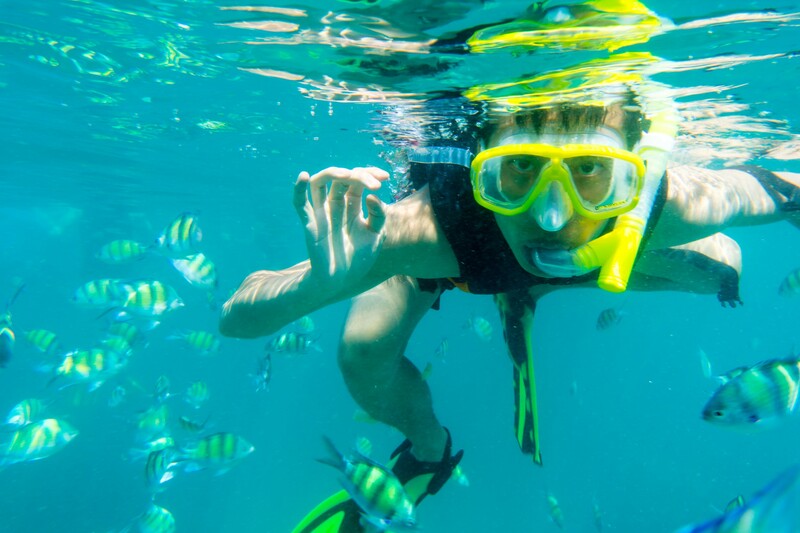 The top recommended and best tour company according our research to use in Phuket is Phuket Sail Tours and Simba Sea Trips. These two companies have good prices, are safe, and will cancel the tours if there is bad weather. 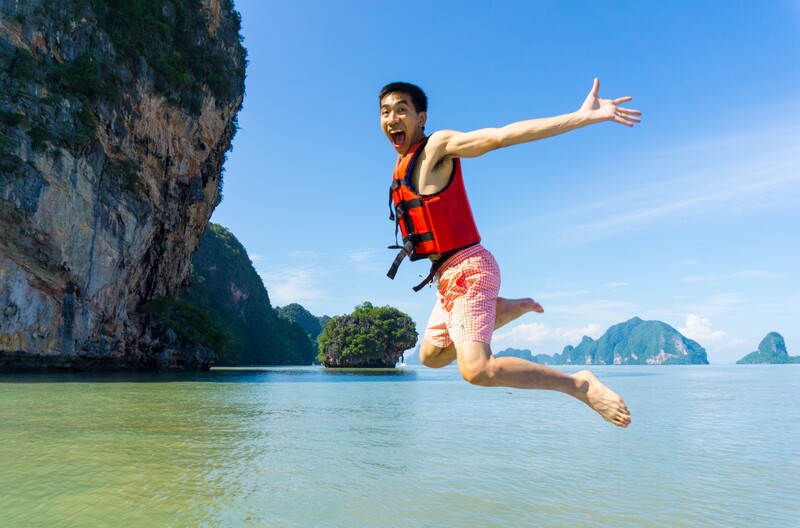 Some other tour companies might still go out with bad weather, which can be dangerous. 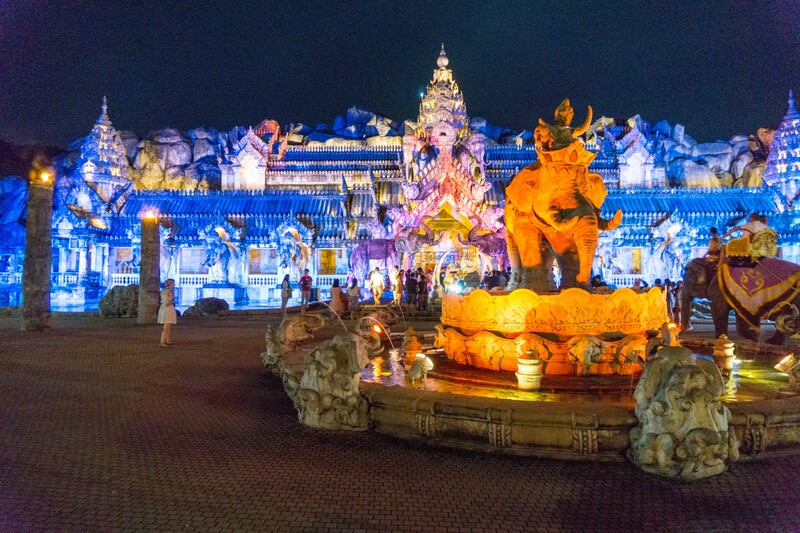 The tour company will arrange transportation for you to the site and provide breakfast and drinks. 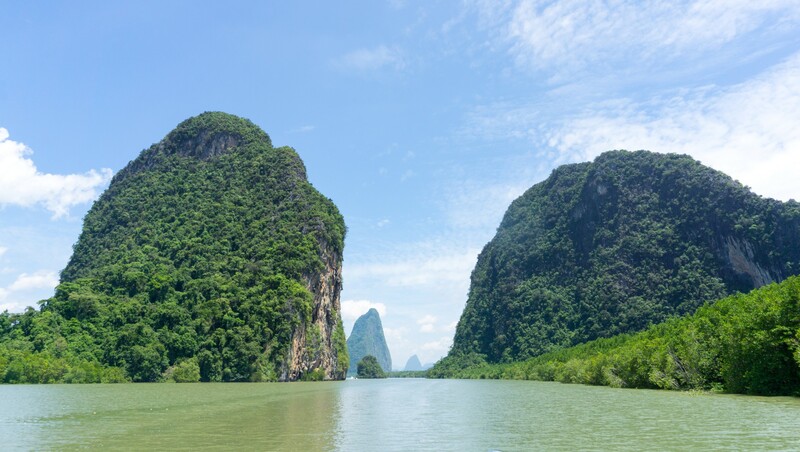 After about 30 minutes of enjoying breakfast, you will get a brief introduction of the tour and what you will be doing that day by your guide. Then your guide will lead your group to the dock where you will get on a speed boat. 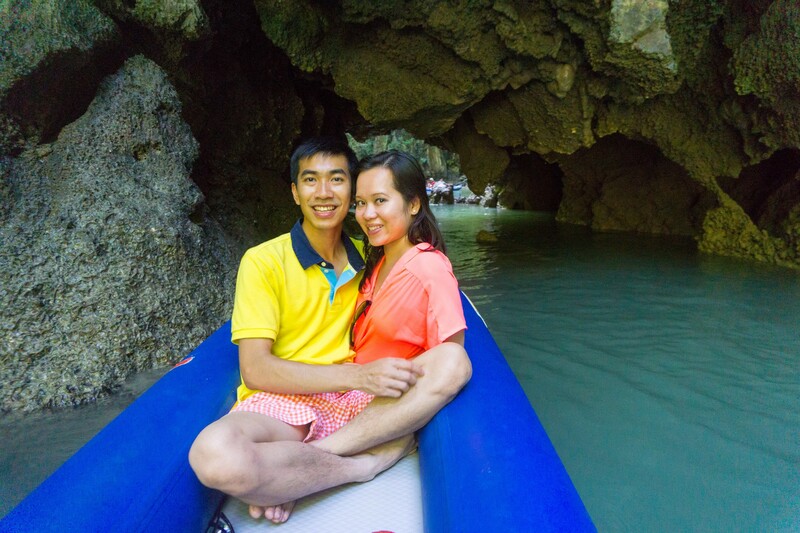 Our tour includes beaching, the famous James Bond island, canoeing, lunch, and visiting floating village. The tour ends around 4pm and they will take you back to your hotel. One thing to note, if you get sea sick on speed boats then we suggest you take a non-drowsy Dramamine prior to the tour. 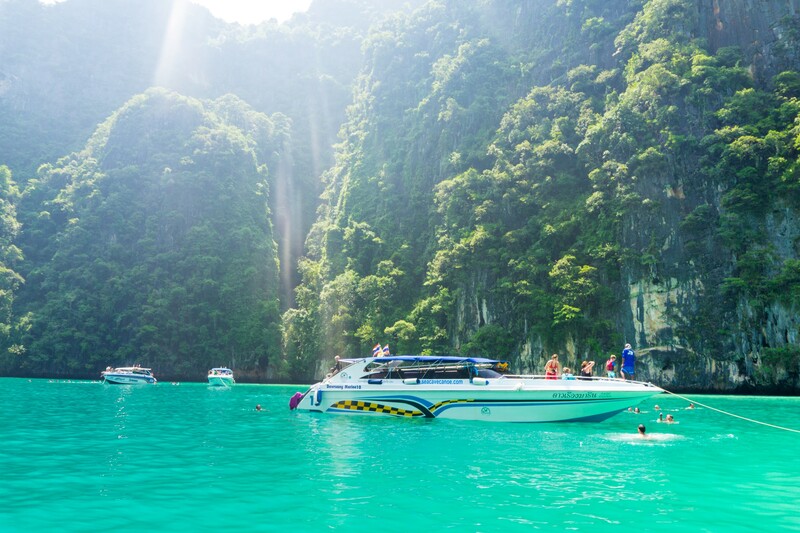 Phuket Sail Tour offers the pill to their passengers however it’s the drowsy kind which could potentially put you to sleep on the boat. 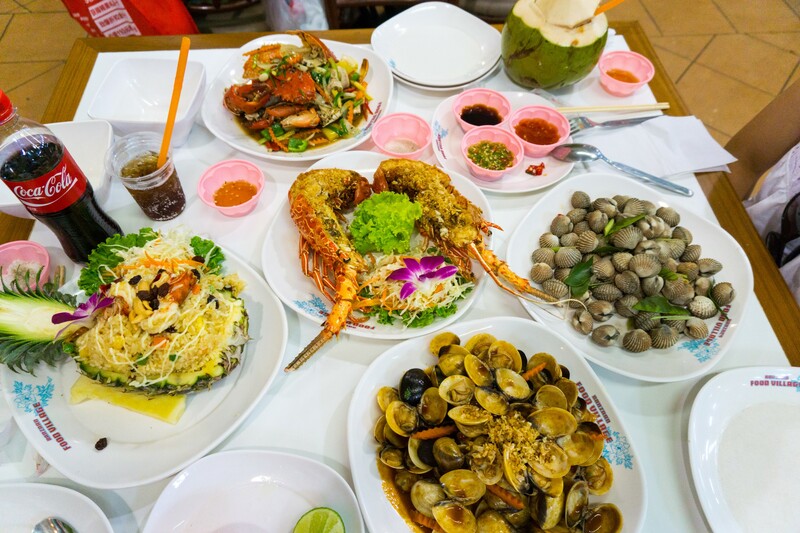 We got back to our hotel around 6pm and proceeded to dinner at the seafood food court like on the first day. We just love seafood! 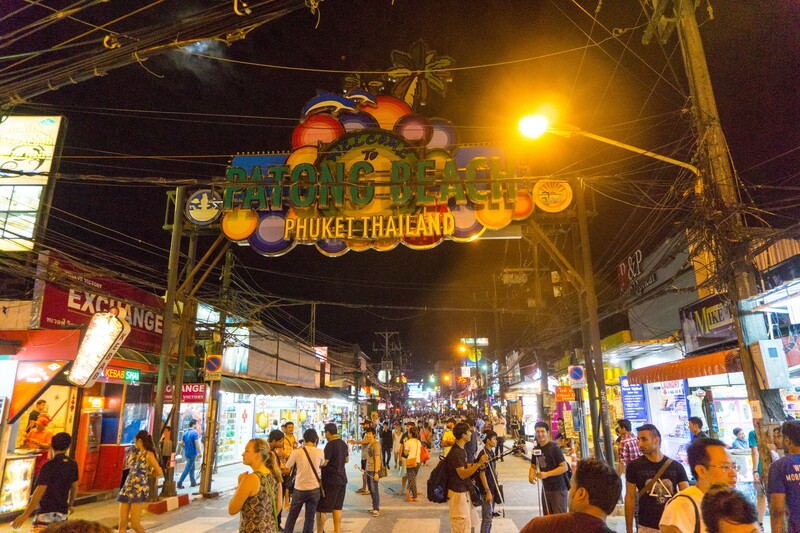 After dinner, we walked through the night market right outside the building we had our dinner then proceeded to Bangla Road for the nightly entertainment. 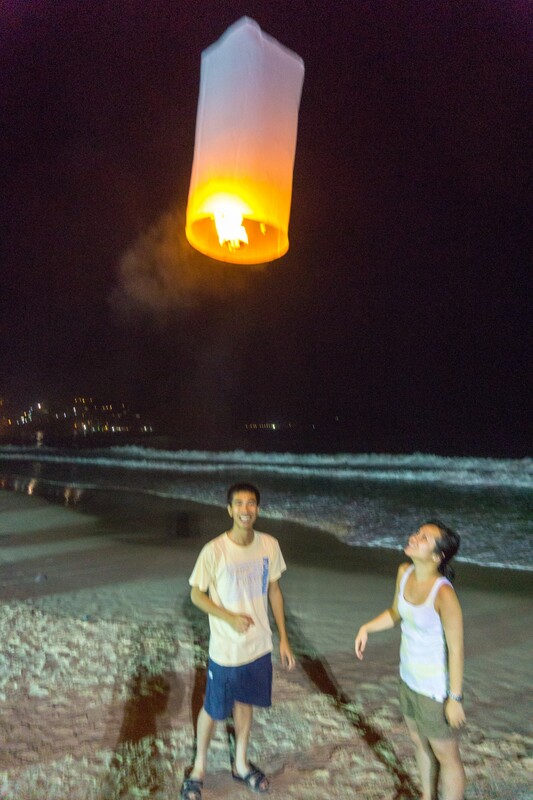 Lastly, we walked to Patong beach where we released lantern to the sky. 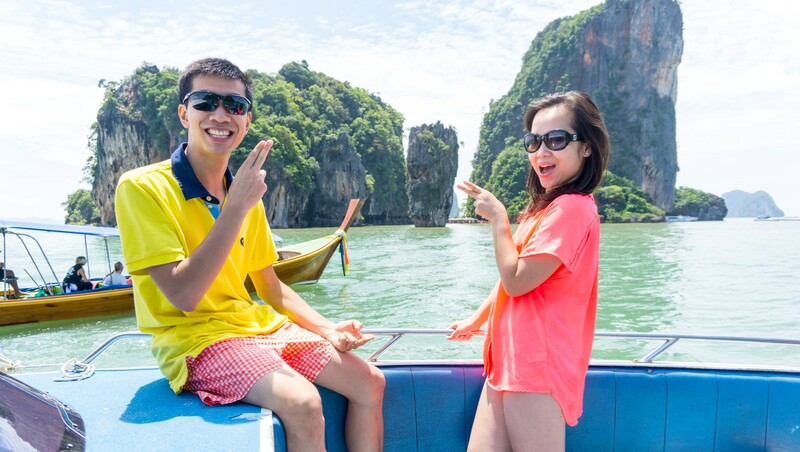 Our last day in Phuket, we took a tour with Phuket Sail Tours again to the famous Phi Phi Islands ($102/pp)…must-do tour! 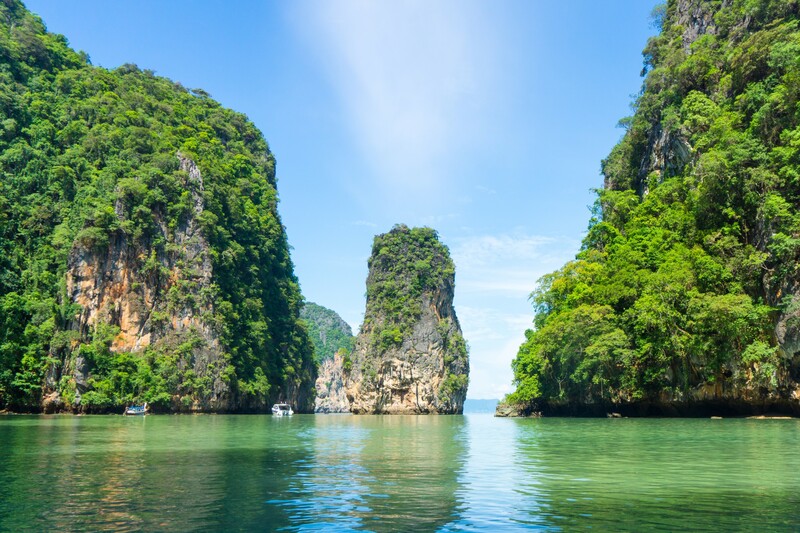 Similar to the Phang Nga Bay tour, this one takes you on a speed boat to secluded islands with beautiful warm white sand beaches and blue water. 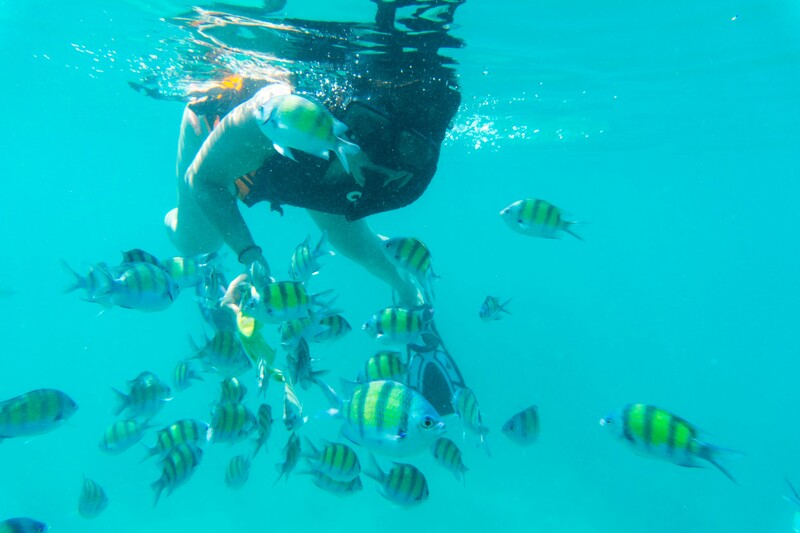 Then we snorkeled in the middle of blue turquoise water to see lots of fishes. 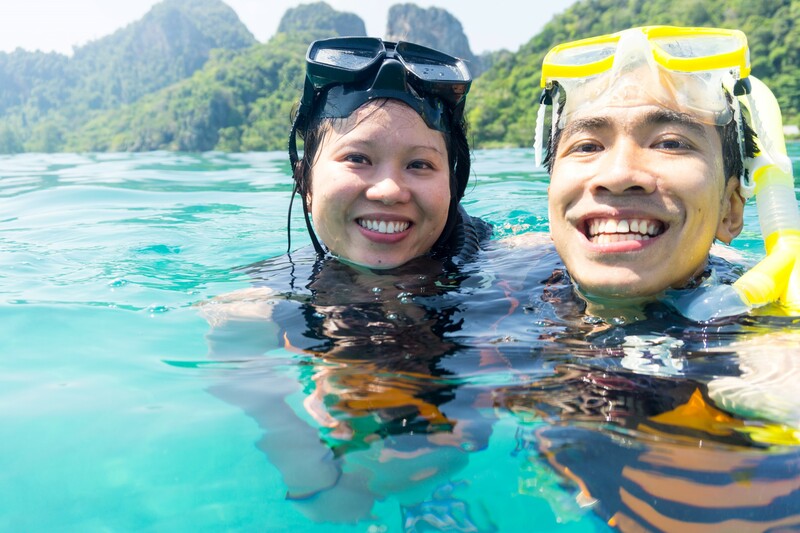 We were not strong swimmers and we were fine to snorkeled as they provided life vest, snorkels, and fins. Then they drop of you of monkey island and lunch. After lunch, it was to the famous Maya beach and more snorkeling. This concludes the end of the tour and we were dropped off at the airport onto our next destination. Very nice!!!! beautiful pictures! this blog is what I’ve been looking for. Would you kindly show which points and airlines did you use for this trip? I plan to make a trip next year from US-BKK-VN and VN-JP-US. I am thinking using Alaska points and Cathay Pacific. 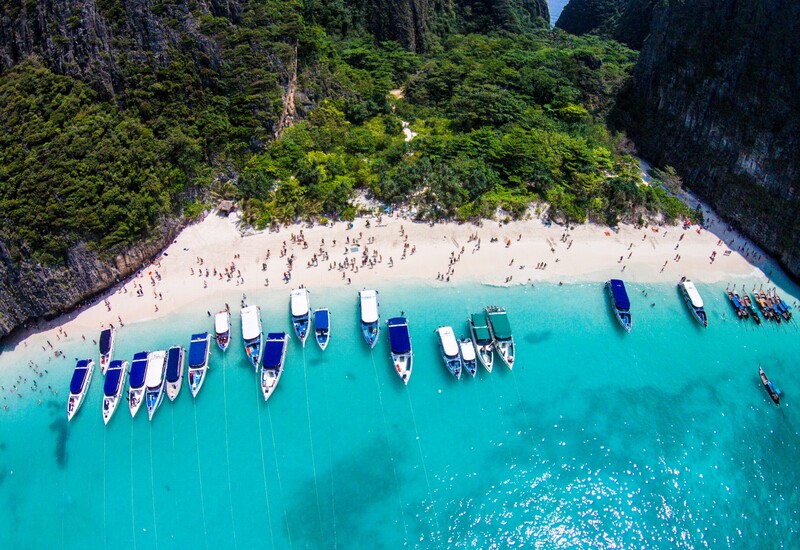 Can I fly straight to Phuket from the States or do I need to stop by BKK? Any input is appreciated. Thanks! Hi Vivian! There are many types of points you can use. 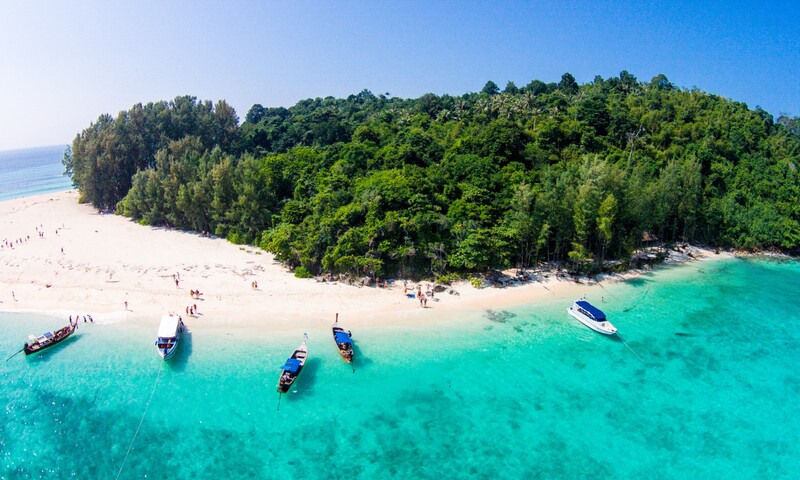 You can use 40k United points for one way from US to Phuket. Using Alaska for AA points for Cathay Pacific is also a good idea, the flight would go from USA to HK then to Phuket. You didn’t mention whether you want to go in Economy or Business class. 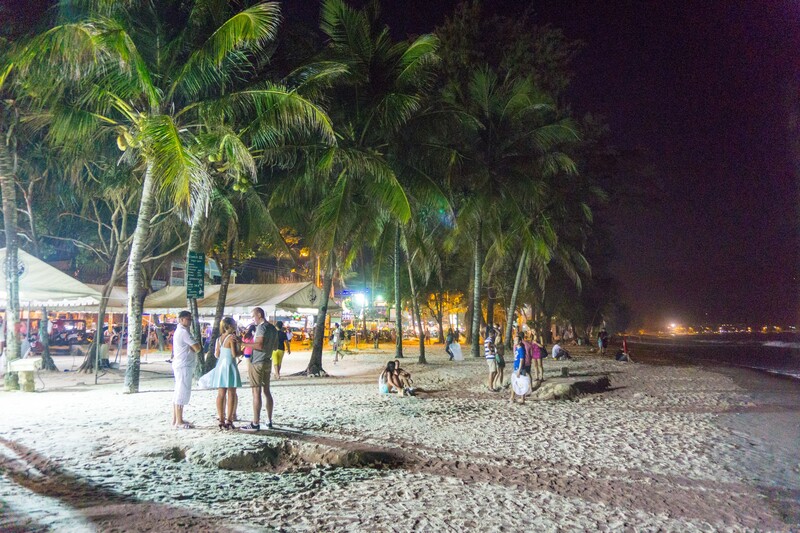 But yes, to answer your question you can use points to get to Phuket from USA. However, the flight will still have at least 1 or two stops either in Hong Kong, or BKK. 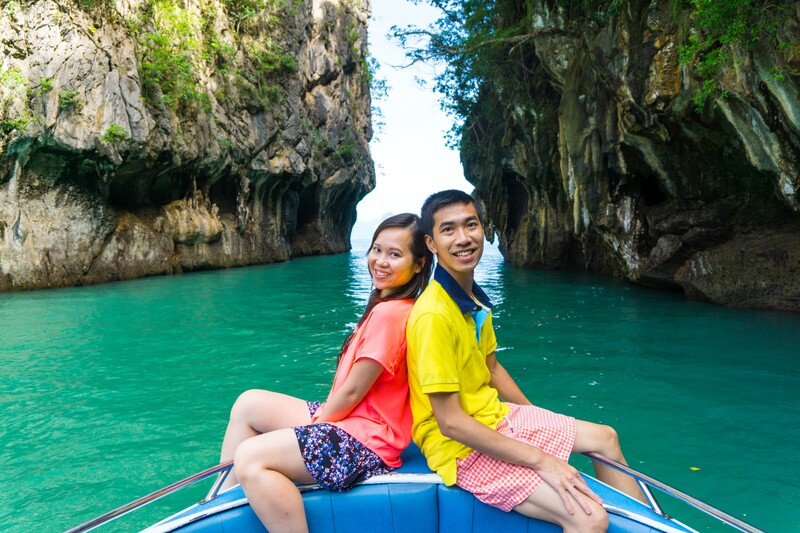 We personally used United points and flew to Hong Kong first, then bought AirAsia tickets from HK to Phuket. Basically, use points to get you to the first main destination, then buy AirAsia tickets to hop different places. Going home from VN, you can use United or AA/Alaska points for the return one way award ticket. Thank you for responding. I don’t have United points :). I hope to at least get us 4 coach seats using Alaska and some spg points . Can we book coach seats now and when we have enough points, we upgrade to business seats? 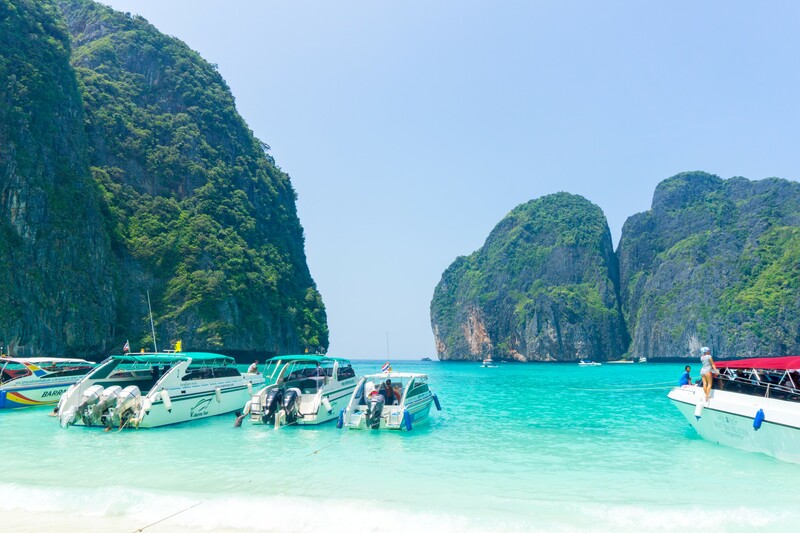 I now have Phuket on my list now. Love the pictures, especially of seafood, look so delish!